Even though our furry friends are just that – furry – even the poofiest pooches can get a bit chilly in the UK’s icy winter temperatures. Yes, dogs were originally wild animals (and some still are), but a few thousand years of domestication has led to a love of pampering. And who can blame them?! With that in mind, here are a few ways to help your dog keep comfy while travelling in winter. This might seem like an obvious point, but when you’re planning your holiday with your canine friend(s), it’s definitely the most important! The words ‘dog-friendly accommodation’ are like music to a dog owner’s ears, as the vast majority of accommodation is human-only. Finding the perfect hotel, self-catering cottage or bed and breakfast can often feel like stumbling upon gold dust. It’s not often that you find all your preferred amenities and luxuries in a property, with the addition of it being dog-friendly. When it comes to finding the right accommodation for you and your dog in winter, comfort is key. Is there a safe, warm place for your dog to sleep? Is there a roaring fire to up the cosy factor? Is there an enclosed garden, so that you don’t have to walk around in the cold with your dog while they do their business? All of these elements make a holiday much easier and more enjoyable for you and your pup, so make sure you’re armed with your tick list before you browse! Woodfarm Barns has all of these features, and more. We don’t just tolerate dogs – we encourage them! And that’s why our beautiful, luxury, dog-friendly holiday cottages are a perfect choice for holidays all throughout the year, and also why we’ve built our reputation in this market. If your dog loves to snuggle, ensure you bring a couple of their favourite blankets with you in your suitcase. Often, we care about our own comforts and forget that our pets enjoy theirs too. Bringing a couple of blankets along on your trip will not only keep your dog warm, but will provide them with a familiar scent of home. This is often very handy when a dog is in an unknown place, as it is likely to help them settle into their surroundings. Although we are usually blessed (or cursed, depending on how you look at it) with only a couple of days’ worth of snow per year in the UK, it often settles quickly during those cold January and February months, creating a super fun situation for our dogs. It’s a real pleasure to watch your pet playing in the snow, however, it’s very important that their fur and paws are cleared of snow once they’re finished. Firstly, snow can become contaminated with chemical-containing products such as anti-freeze and de-icer. If your dog licks their paws after paying in snow, they could ingest those same products and become ill. Also, snow can dry out your dog’s paw pads and cause them to crack, making it painful for your dog to walk. When they come back inside from playing in the snow, simply wipe down your dog’s fur and paws with a towel to clear away the snow or ice. Of course we all know that dogs should not be left in hot cars, but did you know that cold cars can be deadly too? Car interiors lose heat very quickly in cold weather, meaning that anything left inside will become cold, including your dog. It’s most likely that they’ll just be uncomfortable, however in particularly cold climates or if your dog is exposed to low temperatures for a long time, they could develop hypothermia. If you’re going to be travelling with your dog in the car, try planning ahead to make sure the places you’re visiting allow dogs. That way, your dog will be safe and happy knowing that they are with you, and you can rest assured that they are comfortable. 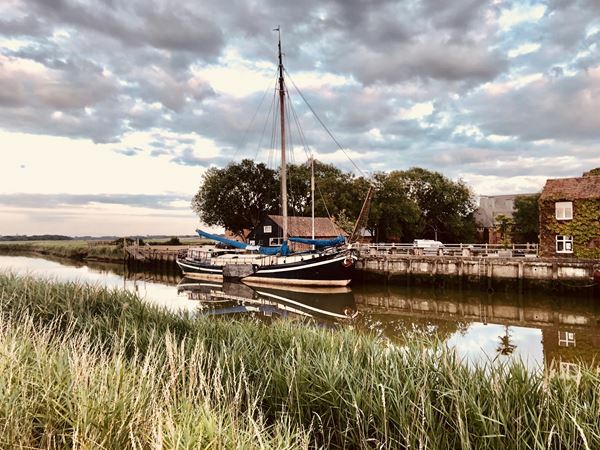 For Suffolk-based holidays, the Woodfarm Barns-owned website whered www.wheredowe.co.uk owe.co.uk has lots of info on dog-friendly restaurants, shopping facilities and, of course, walks. 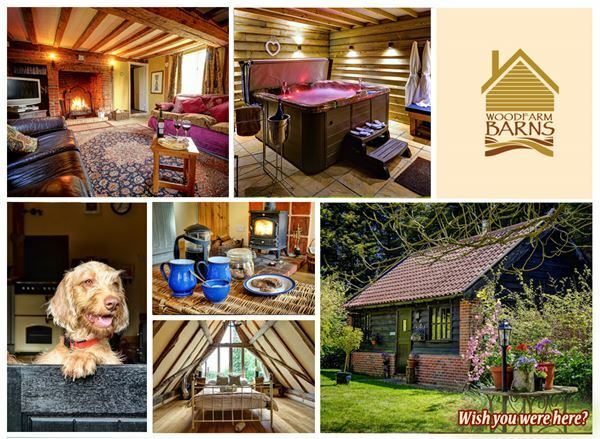 We at Woodfarm Barns and Barges hope you have a waggly tail of a time, wherever you plan to go on your winter holiday. We hope our top tips for dog-friendly winter travel come in handy, and help you and you dog keep safe and comfortable, and have lots of fun!